4.88 mi. ; from I-95 southeast to BWI Passenger Terminal. With the opening of BWI Airport (originally Friendship Intl. ), a spur was built south of the B-W Parkway, designated MD 46. The parallel stretch of I-95 was opened around 1971, along with a piece of the eventual I-195 south to US 1, leaving a gap between US 1 and the B-W Parkway. The 195 designation may have been killed for a while and then revived; Rand McNally atlases of the seventies already showed both pieces as I-195, then later changed to MD 166 for the northern section and MD 46 for the original southern spur, and returning to I-195 by 1990. The final section completing I-195 was opened in June, 1990, and is 4 lanes for its entire length with concrete surface in the new section. In linking to the old 46 segment, the B-W Parkway interchange was overhauled. 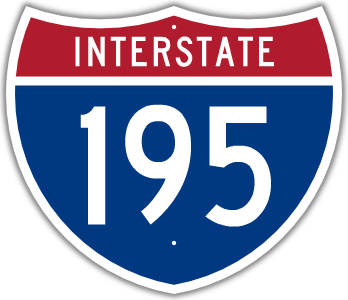 MD 166 had its southern end rolled back to I-95, and 46 was eliminated altogether. I-195 'blows over' I-895 with no access, and is signed with east-west cardinal directions, although it is a more north-south alignment, because of the more east-west run of I-95, and the need to keep the directional signage of each route more or less "perpendicular".